Country Estates Living offers the most spectacular scenery in all of southern Utah! Enjoy the breathtaking view of red mountains and blue sky right from your tranquil backyard with this custom home! Opportunity is knocking with this approx. 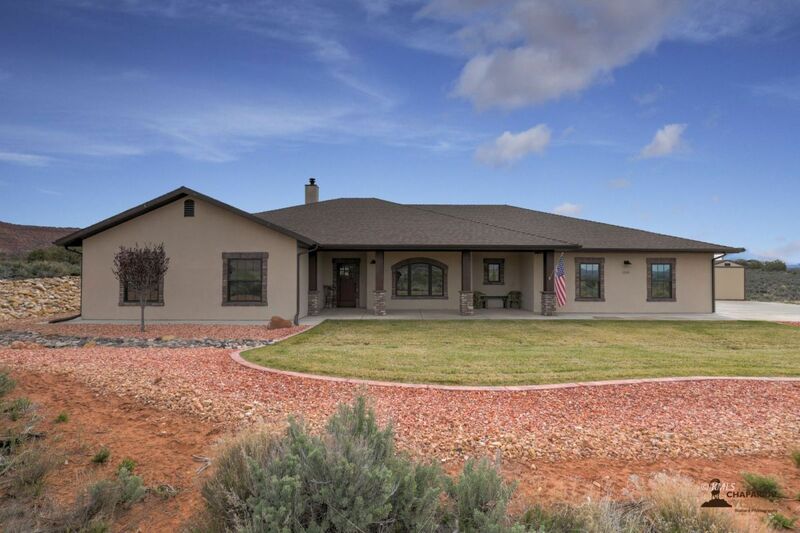 2,734 sq ft home on1.22+/- acres nestled among the Vermilion cliffs of Kanab! This property has a well manicured yard, garden area, large lawn with automatic sprinklers, and of course plenty of outdoor living space to enjoy the surrounding beauty! Inside you will find an open concept kitchen, dining room and living room with nice views and a cozy feel. A wood burning stove, custom blinds, and ceiling fans make for efficient heating while engineered hardwood floors add a modern updated touch. Built in 2015 this home has 3 bedrooms plus a bonus room, an office/den, large bright modern kitchen with an over sized pantry, and 2 1/2 bathrooms. Two car garage, garden shed, and two covered porches to sweeten the deal, making this one home you won't want to miss!